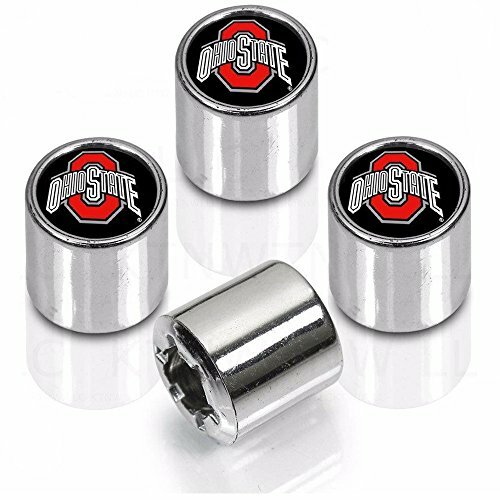 Set of four chrome finished team logo tire valve stem caps. Simply screw onto your tire valve stem. Lightweight and designed not to disturb your tire's balance. Tire valve stem caps are strong durable chrome plated ABS plastic. Domed logos and caps designed to last for years - permanent, fade-resistant, waterproof, polyurethane. Cap will fit on most standard size tire valve stems. May not fit on some cars that have TPMS. Please check your TPMS valve stem size. Brand new, top quality, officially licensed sports team product. Made in USA.